Clara: "Oh, my poor Nutcracker!" Nutcracker: "Don't worry, Clara. I'm just wood. Remember?" Barbie sells. There's no doubt that ever since her introduction in 1959, the blonde-haired fashion doll has ruled the dreams of many young girls, and padded the bottom-line of Mattel handsomely. As a boy, I gravitated towards G.I. Joes, but there was no escaping the ever-growing world of Barbie in toy stores as her empire grew. It is kind of surprising that she hasn't appeared in a feature-length animated film until 2001, with Artisan's Barbie In The Nutcracker, featuring, of course, Tchaikovsky's grand compositions. Using CGI effects, director Owen Hurley has transformed Barbie into a fully animated character. The animation is not as sophisticated as Pixar's work, but for the intended audience I'm certain it will be completely captivating. All of the characters movements are fluid and natural, most notably during the dance sequences. Actual ballerinas were filmed, and then their movements were translated into the final animated product. Based on E.T.A. Hoffmann's story, the film begins with Barbie and little sister Kelly practicing ballet. That was my first cringe of an expected marketing barrage of assorted Mattel products, but I'm glad to say you needn't be concerned. The story quickly advances as Barbie narrates a tale to her sister in order to boost her confidence as a dancer. In the story, Clara (played by Barbie) is a young girl who receives a special wooden Nutcracker from her aunt. The Nutcracker comes to life at night to protect her from the evil Mouse King (voiced by Tim Curry), and during a battle Clara is shrunk down by a magic spell to the size of the Nutcracker. This forms the crux of the plot, as the two characters begin a wild adventure to find the Sugarplum Princess and defeat the dreaded Mouse King. There are a fair amount of mildly suspenseful sequences, such as when the group is pursued by the menacing Rock Giant. The scenes inside the dungeon in The Palace Of Sweets, when Clara has to make her way to safety will probably keep some very young viewers on the edge of their seats. This presentation remains fairly faithful to the original story, and includes pleasing choreography by New York City ballet master-in-chief Peter Martins. With the London Symphony Orchestra providing musical accompaniment, it becomes evident that this disc has more going for it than the typical kid-vid title. It would be easy, for the cynic in me, to knock this release as a tacky marketing effort designed as a mandatory Christmas purchase. Not this time, however. Barbie In The Nutcracker is a nicely done animated tale that will please the multitude of fans of America's favorite plastic blonde. Image Transfer Review: The good thing about CG animation is that generally the DVD transfer looks fantastic, as it does here. Artisan offers the film in two formats: 1.33:1 full frame (for those youngsters not yet converted to the joys of widescreen) and the preferred 1.85:1 widescreen transfer. As expected, colors are bright, with nary a flaw to be found. Contrast is excellent, with edges that are smooth and sharp, with good shadow delineation, especially in the darker sequences within the dungeon in The Palace Of Sweets. No noticeable edge enhancement here. Excellent image transfer from Artisan. Audio Transfer Review: Artisan has provided a pair of solid audio tracks, with the most impressive being the 5.1 Dolby Digital mix. Excellent spatial imaging creates an enveloping sound field that is much better than I was expecting. The London Symphony Orchestra score sounds majestic, though I'm sure that will be lost on the tinier viewers, who just want to see Barbie. The character voices are never buried by the score, and sound very crisp. The 2.0 mix is obviously a slightly less robust track, but decent enough for the content. I would have liked to see an isolated music track on this disc, but no such luck. Extras Review: For a disc geared toward the younger set, Artisan has not loaded this release with a wide array of supplementals. The menu system features Barbie speaking and explaining the various options. The 22 chapters are referred to as "My Favorite Scenes," and the extras are grouped in a "More Fun!" category. This a nice documentary that allows six different girls (2 dancers and 4 students) tell their stories. All of the girls are from the School Of American Ballet, and each get the opportunity to discuss the hard work and endless practices involved in becoming a ballerina. It's clear that their goals require a lot of work and hardship, and this piece presents that single-minded dedication fairly well. I imagine some young girls will want to be a ballerina because Barbie is, and this documentary may inadvertently take a little of the gloss off of that dream. This segment allows young, would-be ballerinas to recreate scenes from the film, based on one of Barbie's particular traits, in one of four separate areas: Brave, Kind, Clever or Special. Each area includes a "Practice" and "Act" option, and features a specific scene from Barbie's Nutcracker adventure. Barbie narrates, and instructs the future ballerinas what to do as the scenes play. 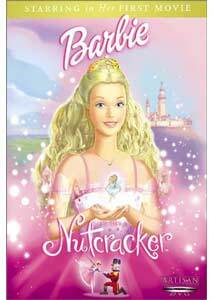 Barbie In The Nutcracker is geared toward rabid, Barbie-toting girls, and this DVD should not disappoint them one bit. The story is a classic, and the London Symphony Orchestra adds a level of sophistication to the film. Mattel wisely limits the overt product placement, and the result is a pleasant animated adventure targeted toward the often forgotten young girls market. Recommended for Barbie fans only.